It's been some time since I did a book review, so I've chosen a title I read some months ago, but is still fresh enough in my head to speak of. 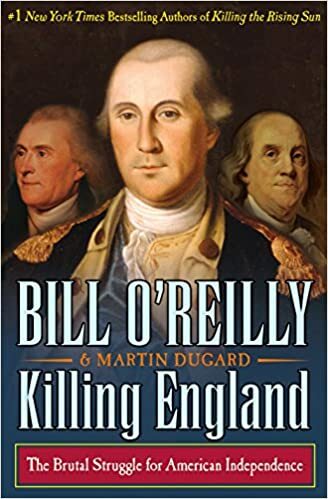 I admit that I wasn't waiting for Killing England to release - I wasn't even familiar with the 'killing' series before I noticed an advertisement for the book in, of all places, Walmart, but I have a standing interest in the American War of Independence, and this title thus caught my attention. The first thing that I personally had to take into account whilst enjoying this book is that it is not comparable to Jeff Shaara's The Glorious Cause. I wouldn't call the two books apples and oranges - perhaps a better comparison would be Georgia peaches with peaches from...anywhere else. One is a factual peach, while the other, to many of us, is the stylized image of a peach. The Glorious Cause is most certainly steeped in reality and is based heavily around actual historical data, but at its core, it is still a work of fiction, particularly in the behavior of the major characters throughout, some of whom tend to be reduced to their most base common denominator. Killing England, by contrast, is a true documentary, and though it also follows the actions, behavior, and thoughts of certain key players of the time, it does so from a detached and clearly biographical perspective. These facts are still presented in enough of a storylike fashion to maintain interest even in those with a passing desire for the topic. This is fortunate, given I am most likely not the only person who better recalls facts learned in an enjoyable way. I was not reading a physical copy, and thus didn't notice the page count until I came to the end of the main story. I was intrigued to find that (at least formatted on my device) there were still nearly a hundred pages to read. These consisted entirely of posthumous 'where are they now' bits, chronicling the lives of the key players from the end of the war until their deaths. I do enjoy a factual account that assumes portrayed persons had lives outside of the event being accounted for, and thus I found it worthwhile to read all the way to the end - nearly all of this was information I was not previously privy to. The title is not without its tribulations. For one, you can tell this was written by a person who knows that shocking news gets attention, for there is a certain seemingly unnecessary focus on topics such as what exactly happens to your body when you are hanged, and various other depictions of gore that all culminate in the understanding that yes, war is horrible (we get that, on with the information please). This focus seems to be there mostly to keep reader interest, as though the book were afraid you might put it down for being too dry - I suppose I might have expected this given the overly theatrical title. The passage of time also comes off as convoluted and makes the book a bit harder to follow at times - one moment we're in 1881, and suddenly we're back in 1775 to touch on some information that might have been better served presenting when we were still talking about events taking place in 1775. I found that I could overlook these relatively minor issues and still enjoy this documentary for what it is, especially from the perspective of persons of the time I otherwise knew rather little about (King George III, for example). I learned a great many things, and for that I felt it was time well spent. It's the type of book that will appeal more to folks who already have an interest in the topic, but for those who don't, perhaps aspects of the presentation that I could have done without will help to draw in new reader interest.